Therese is one of my favorites. I wore it a lot this summer when I couldn't wear much else in this hot, humid weather Down South. It is a great review. No, seriously, I'm not just being polite. What I like about it - it's very personal. A while ago I read a beautiful story behind this perfume creation, thought it was extremely romantic and wanted to try (and to love it) so badly that I bought a sample... And didn't like the perfume. After that here and there again and again in many reviews I read the same romantic story, but I knew already how it ended for me, so I wasn't compelled to re-test it. Your review makes me want to give myself another chance with this creation with a beautiful romantic story behind it. Thank you. Lovely review! I only smelled this quite recently - it's hard to pin down as you say, defying description and categorizing, but I do like it very much; I am another of the chosen few who gets along with melon notes, apparently. Interesting. I couldn't love Therese, but what I found was that I came closer to loving it in certain climates and regions. I remember wearing it in the fall in Portland during a leaf storm, and it was melancholy then, in the astringent, cold sunlight amid tumultuous leaves, but it was--if not quite accessible--nevertheless somehow correct. Later that year, I wore it in the hot summer, driving a rented car through Sardegna. The smell of figs was intense in the heat, but there was another smell, too, a dried grass smell, ashy; I don't know what it was but it was a cousin of rosemary or sage. For some reason it was terribly discordant right there, and right then...though maybe it was only echoing some discord it had no cause or control over :) In any case, after that day, I never wore it again. Abigail, wet Dutch climate suites Therese very well too! Thank you Undina for your warm words! 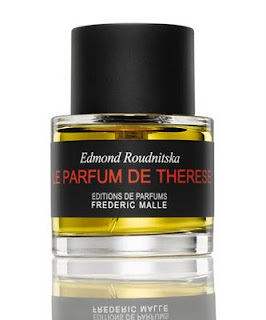 Actually I don't like "stories" at all... Therese is really a perfume on it's own, without any background. Who knows, maybe you can write your own story about your relations with this masterpiece! Flora, melon seems to be one of the most difficult perfume's notes. I don't know another fragrance where melon is so oozy and absolutely not vulgar at the same time! ninja I have similar difficulties with some fragrances: I like how it smells, but I can't wear it even if it smells good on my skin. I adore this perfume (am on my second full bottle after several samples), yet it seems to have little sillage, and I have had no comments from others when I wear it. I wore Femme years ago. I truly wanted to love this but the melon defeated me as well. I haven't given up on it yet - I usually try perfume masterpieces 3 times before I decide they are not for me. that's really interesting, it looks so cool. This is a lovely review! Thanks, Alena! ...could you please keep posting the Russian version as well? Pretty please? About Russian version: it's up to Marina. Perfectly delicate scent! This surely is one of my favorite fragrance of all times. I've been very particular with the type of smell I wear.